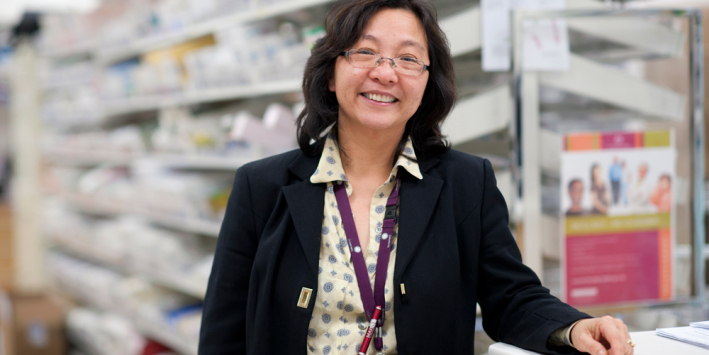 The vision of the Pharmacy Department is to lead in the quality use of medicines in the Women’s specialty areas of maternity, gynaecology and the care of newborns. Pharmacists conduct or participate in clinical research in their quest to provide quality and evidence based practices. The Pharmacy Department supports research involving a therapeutic agent or a pharmacy-related service. Christine Gilmartin is the Clinical Trials and Research Pharmacist for the Women’s. Her role is to provide leadership in clinical research and encourage more inter-disciplinary projects between pharmacy and our various specialised units. Christine has collaborated with research staff both internally and externally. Adherence rates of Vitamin D supplementation in breastfed infants – Is this affected by maternal beliefs about vitamin D? Evaluation of whether rates of vitamin D supplementation adherence in infants is affected by maternal beliefs about medicines. Identification of how healthcare professionals access the Medicines Information Service, determine the trends in the type of enquiries, and evaluation of the satisfaction with the information provided. The neonatal hypoglycaemia guideline and protocol for using glucose gel in the management of neonatal hypoglycaemia was developed and implemented in the postnatal wards of the Women’s. Our research looked at whether the guideline led to better management of neonatal hypoglycaemia and reduced admissions to the NISC unit. Evaluation of the reliability and usability of a new online medicines resource for safety in pregnancy and breastfeeding and identification of areas for improvement. To determine if increasing the amino acid concentration in IVN solutions improves protein intake and growth in very low birth weight infants. Comparison of existing clinical practice guidelines regarding the use of domperidone for increasing breast milk supply within Australian neonatal units. Comparison of the adverse effects and efficacy of intravenous IP infusions with FCM infusions with anaemic gynaecology and obstetrics patients at an Australian metropolitan tertiary hospital.